Airwheel is the state-of-the-art means of transportation adopting aerospace attitude control theory, fuzzy software algorithm, and gyroscope system to maintain balance by leaning forward and backward. Riders can control the vehicle to go forward, accelerate, decelerate, brake, etc. by leaning forward or backward. Similar to the techniques of riding a bicycle, the riders achieve balance on Airwheel by slightly tilting sideways. Airwheel is the greenest and lightest smart unicycle which can be easily carried into buses or subways, facilitating daily commuters. Place Airwheel vertically on the ground and turn it on. The Power Level LED Indicators will be on and the buzzer will beep, and the unit is ready to be used. If Airwheel tilts either forward or backward after powered on, please wait until it adjusts to upright position before riding. A four-bar LED indicator is applied to indicate the power level. All fours will be lit when power level is over 85% and will go off one by one as the level drops. Please check power level every time before usage to ensure there is enough power for a return trip. You may recharge it every time after usage. When power level falls lower than 15%, all four lights will blink and the buzzer will beep. The front end of the pedal will rise to force you to decelerate and eventually stop. Please do not attempt to ride again, otherwise you may suffer a sudden loss of power and fall over. Duration range will be limited during winter, since the battery performance drops sharply in cold weather. For instance, at -15℃, the discharge capacity is only about half compared to that at room temperature. To prevent injuries caused by overspeed, Airwheel sets a maximum speed. When speed exceeds 12km/h, the front end of the pedal will rise gradually and when the speed exceeds 16km/h, the paddle will pose a 10° angle to the leveling surface, which stop you from inclining further to accelerate. The pedal will flatten itself gradually as the speed decreases. NOTE: When approaching the maximum speed, please do not incline further to accelerate so as to avoid injuries. The buzzer will start a long buzz and the LED indicators will flash at the same time. To deactivate this, power off the unit to reboot..
Power on the A/C source after plugging in the charger, otherwise the charger will stop working to avoid charging safety. 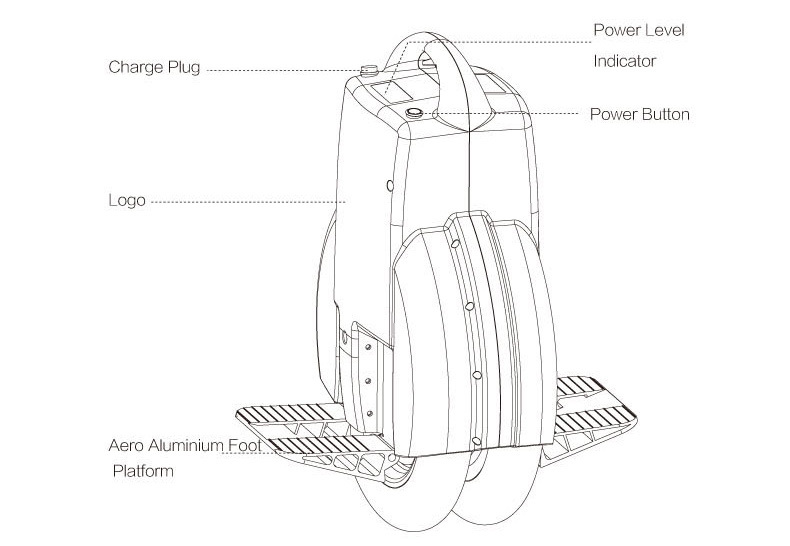 Airwheel is equipped with a high-power charger. Normally it takes about 80 min to be fully charged and 60 min to 80% full. The indicator lights will turn red when charging and green when charging completes. If not for emergencies, please wait until charging completes before unplugging, for battery protection board will conduct SOC equalization as charging completes. Airwheel is featured with water resistant rating. You may ride it in drizzles shortly, yet avoid sinking it in deep water or riding it on rainy days for a long time. Please store Airwheel in a dry location. For non-regular user, recharge the battery every two months to maintain the battery life. Use the extended connector to inflate the tire. Without the connector, you may fail to pump air into the wheel. To repair or change the inner or outer tire, open one side cover (the one without indicator lights). First, unscrew the 14 bolts on the sides, then the 6 bolts on the center, and then open the casing. Take special care with the connecting wires set alongside the inner rim, no dragging or cracking open. A: Electric sparks may flash momentarily at the end of the power cord after maintenance. That is normal and no need to panic. B. Do not open the cap on the side cover with indicator lights. Any Malfunction or damage caused by opening parts unspecified in this manual will not be covered by the warranty.